ISLAMABAD: (APS) US Secretary of State Michael R. Pompeo called on Prime Minister Imran at PM Office on Wednesday. 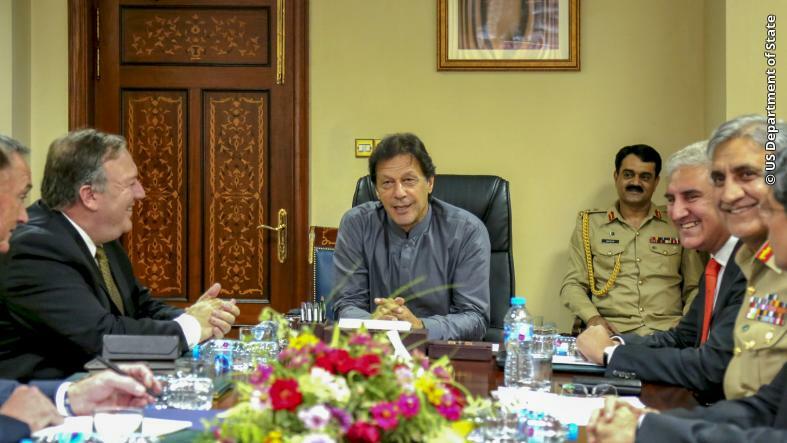 Prime Minister Khan said that his government’s agenda was focussed on human development and poverty alleviation for which peace and stability in the region was a pre-requisite. He underscored his commitment to peace with all neighbours. Prime Minister Khan added that Pakistan looked forward to strengthening its relationship with the US based on trust and respect. He shared Pakistan’s perspective on the situation in the region and reiterated its desire for peace and stability in Afghanistan. Secretary Pompeo congratulated the Prime Minister on forming the government. He appreciated the Prime Minister’s agenda of socio-economic development. Secretary Pompeo conveyed the desire of the US Administration to work with Pakistan to achieve the common objectives of peace and stability in Afghanistan and the region. Earlier in the afternoon, Mr. Pompeo met Foreign Minister Makhdoom Shah Mahmood Qureshi at the Ministry of Foreign Affairs and had a detailed discussion on issues of bilateral importance as well as the situation in Afghanistan.